Since i really want to do something constructive and not just talk all day, here are my observations and ideas in follow up to my original post (Ha! ArtLebedev made a mistake!). What you can see here is that i have integrated the countdown timer into the green light section. I believe that having numbers is not good for couple of reasons, main being that they are not user friendly enough. Numbers are something that you need to learn and understand. Uneducated people, people with all sort of problems (Dyslexia and Dyscalculia), old folks that simply cannot see numbers well, people coming from cultures that simply do not use Arabic number system, and many more will simply fail at recognizing the numbers. That is why a symbolic countdown is better. Green stripe is slowly ticking away, letting you know how much time is left. The ticker could also be applied to red light as well. The turn right arrow is mostly used by the drivers who are really close to it, therefore the countdown timer can be used as well. Furthermore, the arrow needs to be connected with the main light system, triggering it to go yellow as the countdown nears the end, and eventually turning off at the same time as the main system goes green. For some reason, some of the traffic lights here in Zagreb that have the Right Turn arrow attached, turn off green right arrow and then 3 seconds later go Yellow > Green on main system. 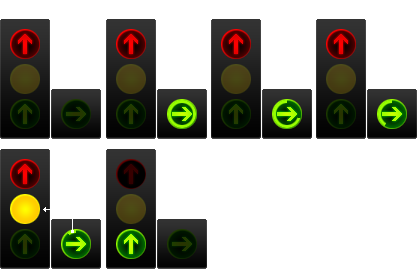 This causes drivers to (usually) break and do nothing for 3 seconds and then accelerate again as the main system goes green. A big big capital fail. Furthermore, pedestrian lights work in unity with car lights, and while car drivers are standing still on their red light, they can observe pedestrian’s green light ticking away. Also, during green light for car drivers, the green pedestrian light in that direction is showing them approximately how much time they have on their green light as well. Some more thought on Art Lebedev‘s two-arrows-in-one-box. Except the fact i stated yesterday: that there is just no need for red light, when absence of green means the same, problem is further increased by the fact that Red-Green color blindness is the most common color blindness, affecting 7-10% of male population. People wearing sun glasses could also misinterpret the sign while it is lit red – as green. Check this visual representation of Red-Green color blindness. This is still not perfect system, maybe if we ever get a project to redesign it we could further improve it. Got better ideas? Share them with us! Nailed! I am all for countdown timers of any sort for green and red lights. Hey Ante. Totally agree with you on that one, but there needs to be some predictability in traffic lights. Let’s say that it is red for all. Then a car comes, and it turns green for him and for the pedestrians in the same direction. The duration of that green light cannot be RANDOM amount, because pedestrians need some time to cross the road, and they need to be confident that they will do it. So the CPU controlling start of green light is OK, but that light still needs predictable, reliable, and have visible timing. And on old crossroads, that time isn’t random. It has exactly the same time (that time isn’t randomly chosen, it was calculated so that traffic would get best flow).